From 2009 until 2013 Rob Stapleton built the website, "P.D. Good's Builder's Manual", (www.pdgood/drumshed) which is a compilation of searches on topics important to drum builders supplemented by correspondence with various manufacturers and individual drum builders, and excerpts from related forums, such as wood worker's and ecology forums. It is STILL the #1 result in a google search for 'how to build a drum'. Rob has graciously given us permission to republish from that wealth of information. He wanted us to acknowledge the now defunct sites drumshed.org and drumtown.info, and all the drum builders out there who contributed to this treasure trove of information. Is it a sharp point, or rounded? What angle is it (both inside and outside the peak)? Where is the peak in relation to the overall thickness of the shell? And of course, you'll want to "true" the edges before you cut your bearing edge. In other words - the edge of the shell should be at a 90 degree angle to the walls of the shell. Often times the edges are uneven and have to be made smooth first and then made perpendicular to the walls. This process is known as "truing" the edge. Below you'll find a healthy discussion from all points of view about bearing edges. If you don't do anything else, you'll want to check out the link at the bottom (http://www.youtube.com/watch?v=w8Gxut0odyc) which shows how extreme the movement of the head is. This link has changed the opinions of many including some who commented here. I've been building stave drums for about a year and a half now and I'm always trying to make the process more efficient. Does anyone have any suggestions as to what is the easiest way to true the edges before routing the bearing edge? Up to this point I've been using a piece of granite and doing it by hand. It works, but takes a very long time and is quite labor intensive. I still think that is the best way. If it takes too long, maybe you are not using rough enough sandpaper on the granite. I did the sandpaper on the table route for a few shells. Then I hit rosewood. That stuff took so long (even with 40 grit sandpaper) that I had to find a better way. I found 35 grit 16" floor sanding discs at Home Depot (in the tool rental dept.) I made a wooden 16" faceplate for my lathe, used spray adhesive to attach the disc, and let 'er rip. Now truing any shell (including rosewood) is much faster. I still use the sandpaper on the table method for post bearing edge touch up if needed. I do it kind of like Steve, except for the lathe. I (ab)use my powerdrill in a horizontal stand with a large disc. Glued some strong bandsanders "paper" to it. You should be able to get the strong stuff at a place were they do flooring and stuff like that. Wouldn't it be easiest to square one end while it's still on the lathe, and then use the squared edge against the table saw fence to cut it to length? At that point it should be close enough to do a full-to-the-outside inner cut and then counter-cut back in. It will leave a small step at first, but after a few trips all the way around, it will level off automatically. Unless your router or table are out of whack. Or am I not understanding your dilemma? I'm using the router table to true the edges. I clamp 3 blocks to the outside of the shell and make sure the shell is exactly at a right angle with the table surface. When I cut off the edge the shell doesn't fall into the router bit as it is held by the blocks. (The blocks must be wide enough to slide over the hole in the router table.) I tried to draw a sketch, but I can also post photos later on. The sketch shows the blocks (dark grey) attached to the shell by clamps. The blocks will be damaged by the router bit on the inside, but that's no problem as long as I don't cut through them. I tried a similar approach as well. I used spacer blocks to keep the long risers out of the router bit's way. Band clamps secured the risers/spacers to the shell. It worked OK, but I didn't get as smooth an edge as I can with sandpaper. Steve, it depends on the type of bearing edge. I usually do double 45 degree edges and I start by cutting the outer champher first, then the inner one which is wide enough to reach the outer one, actually a bit wider. So I get a perfectly sharp edge, which I can easily sand down on a flat surface. Then I round the flat part by hand. It works very well... if you like double 45 degree edges. I'm not sure if/how it works with roundover bearing edges. norbo, how do you like the double 45? How does it compare to other edge treatments? I've only done 2 types of bearing edges: the double 45 and a roundover / 45. (The latter is not a proper roundover, there's still a sharp edge where the inner champher meets the outer round edge. I'm using a 6.3mm roundover bit, which is very big.) 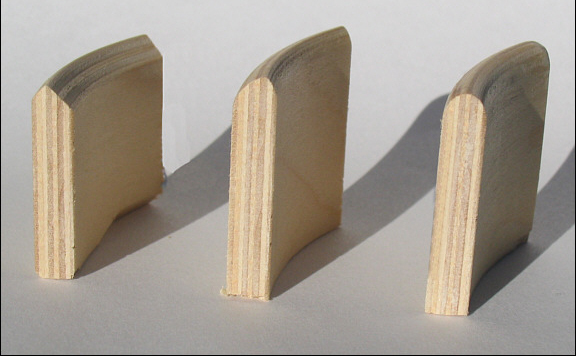 The double 45 is sanded down until the flat part is about 0.5 - 1.0 mm wide. I don't measure, I just stop when it looks and feels right. Then I round the edges of the flat part a bit. That said, the double 45 has more ring, sounds a bit more open. The roundover / 45 is punchier, but the differences are subtle. The influences of the wood and shell dimensions are much more audible IMO. Let alone head selection and tension. The roundover / 45 sounds fantastic on punchier woods such as birch and bubinga. For softer woods such as cherry, walnut, mahogany I've been using the double 45. But as I don't like overtones very much, I'm leaning more towards roundover / 45 lately. I just received 2 and 4 mm roundover bits, that should be a good compromise. I have a question for you all that every once in a while pops up with me when I see pictures/drawings of bearing edges. I'm puzzled with the effect of the angle. The general opinion is that the more degree angle, the more attack, overtones etc. Anyway, it is generaly known, there is an effect. Drumcompanies offer bearingedges in 45, 60 or even 30 degree angle. But is it the angle that contributes to the soundeffect? I have made a drawing to explain what I'm wondering about. Assume the shellthickness is 6 mm (2/8 inch), no double degree edges or roundovers. The "roundover" on the outer edge in the drawing is just the sanding that is needed to smooth the edge. The upper horizontal line represents the drumhead. If you look at the point were the head is touching the shell, the cutting angle doesn't have that much effect to me. The amount of shell surface that is touching the head doesn't change by changing the angle. Also the "sharpness" of the edge doesn't change at the point where shell and head are touching. Specially if you consider that the head is not pulled over on both sides of the edge, only on the outside, where the (small) rounding (ergo, the surface) doesn't change. Or, at least the pressure on the head at the outer edge is bigger compared with presure at the inner edge, so the cutting angle at the inner edges isn't "touched" by the head. Even with an 15 degree angle. Why does changing the angle have effect? Is it the "room of air" between the inner edge and the head that effects resonance/vibration? That wouldn't be likely to me. Changing the rounding on the outer edge and leave the angle at the same degree to gain soundeffect would make more sence to me. The surface where head an shell are touching would become more or less and would kill or produce overtones, attack etc. Could you guys give me your thoughts about this or explain what I'm missing in this world of bearingedges? It's my opinion that the degree of the angle makes no difference what so ever. The only thing that matters is the amount of contact area and the position of the contact area(center, inner,outer) makes no difference either, in my opinion. While I agree that it wouldn't affect how the head interacts with the edge of the shell, a sharper edge cut removes more wood from the shell, making the shell (and the instrument) just a bit lighter. I have no idea if the difference in weight is enough to be heard/noticeable, but it's the only thing I can think of. The bearing edge "angle" is not so important as we think. When the head vibrates, it doesn't contact any of that edge except within a very tiny distance from the peak (event horizon, or boundary layer or whatever other mad scientist term pleases you). If the "event horizon" angle is shallow, the head will "bump" it as it vibrates, dampening the oscillation. If the angle is steep (sharp) the head will oscillate longer. A sharp "cut" angle can have the same effect as a very shallow angle if it is rounded by sanding at that critical contact point. What this means is that the only angle that really counts is a very tiny area and not the rest of the bearing edge that we measure as: 30, 45, 60. A sharp 45 at 3/5 for toms 6, 8, 10 and 12. A lopsided 3/16 round over for the 14 and 16 floor toms. A full half circle 1/8 roundover for the bass. The small toms sound fine, pretty standard. The floors sound really nice. Perfect ringy boom control without any dampening. Very full sound, perhaps because the wide, rounded outer edge lets the curved shoulder of the head seat comfortably and gives ample contact to transmit vibration to the shell. The inner curve provides that "boundary layer" shallowness that damps the ring so it needs no additional dampening. The bass is really, really nice. I use a PS3 and Smooth white ambassador with a hole. No other dampening. I wish I had some sound samples for you. It's a 20" that sounds lower, deeper and louder than my 22" Tama. Seems to me that the inner/middle/outer location would make some difference, if only because the diameter and shape (curved edge) of the head is predetermined and the shell is meeting it in a different place in those instances. This would mean that heads from different companies might meet the bearing edge differently, if the shape of their curve is slightly different. A difference in sound stemming from a difference in the amount of head-to-shell contact? Absolutely. I've noticed this on drums where I've rounded what were originally sharp outer cuts on the bearing edge. A difference in sound stemming from the angle of the inner cut on an otherwise sharp edge - with no change in the location of the apex, and no change in the amount of head-to-shell contact, as shown in TMC's graphics? I'd have to hear it to believe it. true, but my argument is that TMC's graphics doesn't reflect the head vibrating up and down- which would result in a change in the amount of head to shell contact as it oscillates. shallower angle should result in more dampening as the vibrations closer to the edge momentarily come into contact with the shell as it is moving up and down. In theory, I understand exactly what you're saying. I just don't think it makes that much of a difference in the sound of a drum. Unless the head is extraordinarily loose, I can't see the head moving that much, especially out at the edge - not enough to make an audible difference. Granted, this is just one example, but that's my experience. As always, YMMV. Hi there, not too much to add here, just been following along and learning, but on this point above, I think you would be surprised by the amount of travel the head will actually move when struck. Discovery Channel's Time warp, did a show on drums, and the amount of travel was AMAZING to say the least, on the heads as well as cymbals. It might be worth a look to actually see at 10000 FPS what exactly is going on with the head when struck..
Wow, that link is a MUST SEE! I'd propose that the actual function of the bearing edge is to transfer wave energy to the shell, or perhaps, modify the wave energy given to the drum head. A sharp edge has very little contact, of course, but also, less wood mass "behind" the head to accept the wave energy. That little extra wave energy either goes back to the head or dissipates to the air. Two factors at play, then: the location of the edge's center line (increasing / decreasing the working diameter of the head proposed by PDG) determines how much mass can be available "behind" the head, the second is the shape, which defines the actual wood mass receiving vibration. (James). A steep inside angle does not have to exactly go to the shell's outside edge to match the head's crease, you can leave the inside edge short and round the rest. However, that effectively shrinks the diameter of the head, but gives more mass behind the head. I made some new pictures that might make some more sense. To make the Lopsided 3/16 you use the 3/16ths round bit and adjust it to different heights inside and out. If your shell is thicker you have to use a bigger bit or you might risk making a full roundover with no peak. The bit radius has to be bigger than half the thickness of the shell. You could also move the peak in or out just like the standard 45.